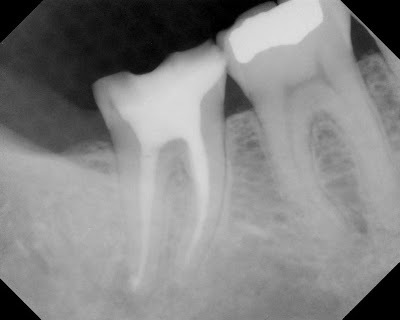 Look closely and you can see a separated file in the mesial root. The contrast feature makes the separated instrument a little more obvious. 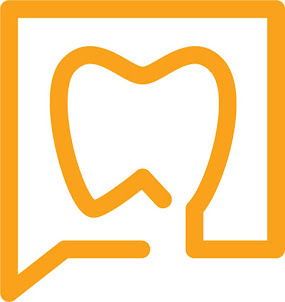 For more information about removing a separated instrument, click here. For information about PREVENTING a separated instrument, click here. those videos intrigue the heck out of me! Just had this procedure done today to #29. 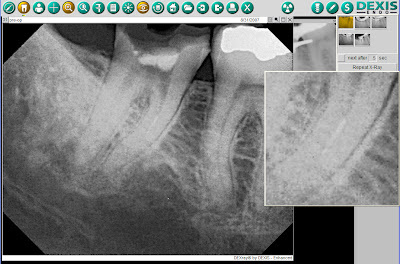 Took longer than expected, but apparently my canals converged at 23mm and then the root turned abruptly right after--that caused the separation. The instrument became visible after irrigating one canal--it was pushed over into the other. 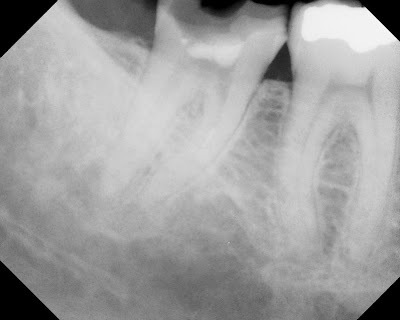 I appreciated my endodontist's explanations of what he planned to do, what he was doing, and his post-procedure explanations. I am chewing on the other side of my mouth for now, and the pain is nothing that 2 Advils can't fix. In two weeks, a crown.